High level delegation of Serbia, headed by H. E. Mr. Ivica Dacic, First Deputy Prime Minister and Minister of Interior, visited Japan and had a number of meetings with the high ranking Japanese officials. H. E. Mr. Dacic is the first Minister of Interior of Serbia to officially visit Japan. During his meeting with H. E. Ms. Tomiko Okazaki, State Minister and Chairman of the National Commission of Public Safety, the Memorandum on Police Cooperation was signed, enabling closer ties between the police authorities of the two countries. 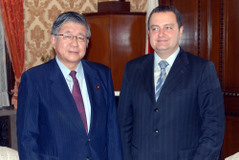 During his visit to Japan, H. E. Mr. Dacic also had meetings with the Hon. Mr. Takahiro Yokomichi, Speaker of the House of Representatives of the National Diet of Japan, Mr. Hisashi Tokunaga, Parliamentary Vice Minister for Foreign Affairs, Mr. Shozo Azuma, Senior Vice Minister of Cabinet Office for Disaster Management, Mr. Takaharu Ando, Commissioner of the National Police Agency, Mr. Ichiro Aisawa, President of the Japan-Serbia Parliamentary League of Friendship, as well as Mr. Jiro Kodera, Director General of the European Affairs Bureau of the Ministry of Foreign Affairs. The delegation also visited the Center for Disaster Prevention and the Traffic Control Center in Tokyo, as well as the Honorary Consulate General of the Republic of Serbia in Kansai, where they were welcomed by the Honorary Consul General Mr. Naohide Ueyama and H. E. Mr. Ryuichi Tanabe, Ambassador, Representative of the Government of Japan for Kansai region.